What are best categories to shop this month? August is a huge month for travel deals, as evidenced by all the airfare sales we saw last year. Southwest Airlines offered a nationwide 3-day sale with one-way flights starting at just $40 as well as a 2-day sale for $42 flights before 7 am or after 7 pm. Not to be outdone, Frontier Airlines discounted select domestic flights 90% and offered a 75% off promo for flights booked by August 9th. Set those deal alerts for more flight deals coming this month. If you can't get away, throw a backyard BBQ for an easy escape. Given the abundance of outdoor grills and home and garden deals we expect to see this month, now's the time to spruce up that garden. Last year, Lowe's had 50% off select planters for $4 and Walmart had a huge grill clearance sale. We also saw a Dewalt 40 piece screwdriver set on sale for $15 at Ace Hardware as well as a $27 wrench set from Sears. You can save $5 off garden orders of $50 at Home Depot when you sign up for their newsletter. Speaking of outdoor activities, it's also a good time to stock up on camping and outdoor accessories like tumblers and travel mugs. 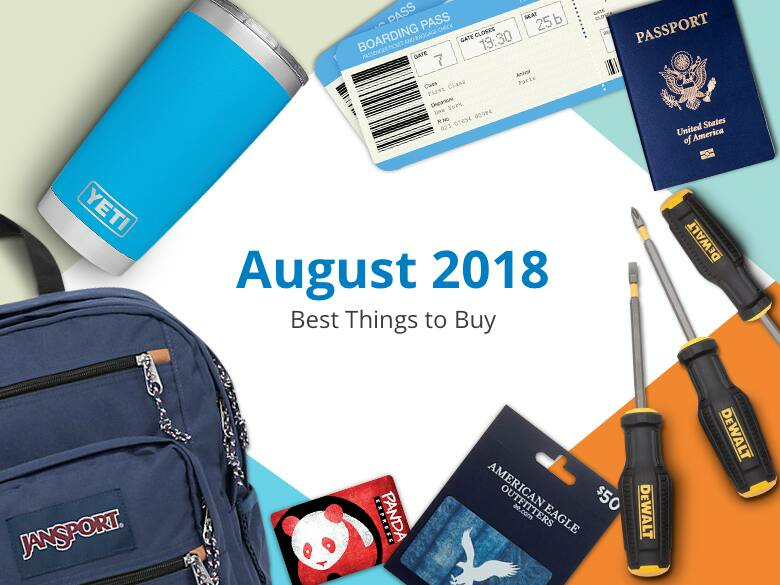 Last year, Walmart offered up $5 Ozark Trail tumblers and Amazon had Contigo stainless steel travel mugs for $8.80. With summer coming to an end, keep an eye out for end of summer clearance sales on apparel, shoes and accessories. This is the month to stock up on additional back-to-school supplies that you may not have purchased in July, especially backpacks. Lands' End slashed backpacks and lunchboxes 50% off and we saw kids character backpacks like Super Mario, Pokemon and Disney Tsum Tsums for a mere $13. American Eagle Outfitters has tons of sales around this time including their extra 40% off clearance sale and more. Save $5 off your $25 order at Staples with text sign-up on those school supplies. All this summer shopping is sure to stir up an appetite. You're in luck as we expect to see tons of free and discounted food deals this month. Panda Express was the most popular one with $3 off a $5 online purchase. PF Chang's offered a free entree with entree purchase and Smashburger had a BOGO coupon for entrees as well. McDonald's is offering any Premium Burger or Chicken Sandwich for $1 as well as free fries on Friday with $1 purchase. Download their app to get these savings now through 9/30. You won't go hungry with all these freebies! Amy Chang is a Los Angeles based writer, currently dedicating her day job to spreading the word about Slickdeals. She has written for several companies including Yahoo!, The Scratch, Slickdeals, and Yelp as well as maintaining her own personal food blog. In her downtime, she loves spending time with her two rescue kitties, online shopping, and exploring new culinary experiences.